I've been baking cakes, muffins and bread but I never tried baking cookies. The other day, I tried to bake some home-made cookies because my hubby likes it. 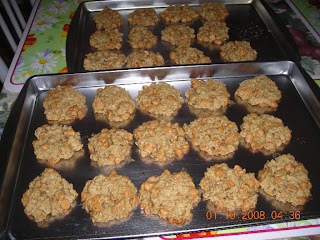 I baked oatmeal-butterscotch cookies and to my surprise they turned out good. They're delicious and my hubby and I have been eating them. I offered him to take some to his work yesterday but he forgot. Oh well, more for us to eat. hi sis...thanks for dropping by to my blog. Please vote my blog here for Best blog and here for my domain. I'm sorry to bother you sis but i need your vote to both blogs.